Mexico's new President Andres Manuel Lopez Obrador holds a news conference at National Palace in Mexico City, Mexico, Dec. 3, 2018. "Isn't that a change that I am here, informing you?" Lopez Obrador asked. While past presidents have rarely held news conferences, Lopez Obrador promised to do so on a near-daily basis, much as he did when he was mayor of Mexico City from 2000-2005. "He didn't hit the ground running, he hit the ground flying," said Federico Estevez, a political science professor at the Autonomous Technological Institute of Mexico, who was impressed by the president's ability to improvise and speak for hours on end without using a teleprompter. Estevez compared Lopez Obrador's start to the early days of U.S. President Franklin Roosevelt, minus the fireside chats. "It's very similar. And (Lopez Obrador) is going to build his party into a generational force, and the opposition is going to remain a minority for God knows how long." 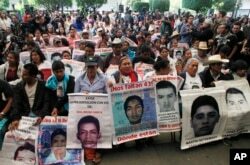 FILE - Relatives of 43 missing students missing since they were taken by local police in September 2014 hold photos of their loved ones, April 24, 2016. Prosecutors have said the students from a teachers college in southern Guerrero state were killed by a drug gang and their bodies incinerated in a massive fire. But conclusive evidence has never been found or presented, leading the students' parents on a frustrating, painful four-year quest for the truth. "We have hope that he will be more humane," said Maria Martinez, the mother of one of the missing students. Referring to Lopez Obrador's two previous failed presidential bids, she told him: "You set the example for us that he who perseveres will triumph eventually. You are a good example that one has to keep fighting." Earlier, the new president arrived at Mexico City's National Palace in the same white Volkswagen Jetta compact car he used before taking office Saturday. He has refused the military bodyguards used by past presidents and travels with a small staff of aides who provide security. He usually travels economy class. Following a lengthy inauguration address on Saturday, he spent more than an hour-and-a-half speaking in Mexico City's main square, talking about government programs in granular detail: how concrete for roads would be mixed to maximize the use of local labor, and which animal and tree species would be best for agriculture and reforestation programs. During Monday's news conference, Lopez Obrador claimed that the number of murders had declined during his first two days in office. The president also said the necessary work would continue to complete the foundations of a partly built Mexico City airport project he plans to cancel in favor of expanding existing airports. Officials did not say what will be done with the vast airport foundations being built on a former lake bed known as Texcoco. But further work is needed to keep the slabs from decaying or sinking. FILE - Construction work is seen on a new airport in Texcoco, Mexico, Oct. 17, 2018. "The messages so far have not eliminated the uncertainty about what may happen under Lopez Obrador's administration, but they haven't worsened it," Mexico-based CIBanco said in a statement. "The new government has generated both hope and uncertainty," wrote Alfredo Coutino, Latin America director at Moody's Analytics. "While the political climate and the economy are relatively stable, the new administration faces important challenges that will demand experience and ability to ensure a smooth political transition and sound economic performance. Markets still remain on standby."